Desks vs Tables? 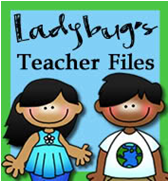 Join the Linky Party at Ladybug's Teacher Files. 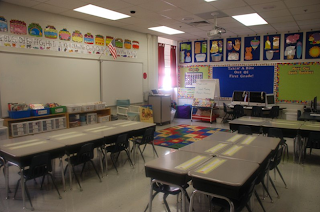 When I first started teaching I really wanted tables. I had a larger room than my current room, and they worked out fairly well. Tables take up less space than desks and don't scoot around the room like desks do. But, they also require more space somewhere else for storage. You need little caddies for supplies in the middle of the table, plue space to store larger binders and books. I used Seat Sacks to hold student supplies. I hated them. After awhile they rip and the kids' stuff is always just crammed inside. Now I have moved to the smallest room possible to teach 20 children. And, surprisingly even though the room is smaller I chose to go with desks. I like the flexibility of moving children whenever I want to, without having to worry about moving their nametags. I also like being able to re-arrange my room whenever I get a whim (although this is getting harder with more children each year). I also think children like having their own supplies. I use the little plastic tubs (they sell them in a 4-pack at Office Depot) to store their supplies. Each child has their own and it fits perfectly inside one-half of their desk. I keep the lids, so the tub is easily pulled out like a drawer. The other half of their desk holds all their notebooks, journals, and folders. If you look closely at these pictures, you'll see my room consists of desks, my table for small groups, one table for computers and some shelves. In a perfect world it would be much bigger with tables for students to work in small groups and a nice big carpet for the library area-- but it's not a perfect world! know my class better I split up the desks into 4 groups. I like the set up. you wouldn't happen to have a picture of the little tubs you talked about that go onside their desks? The pencil boxes wore me out last year...they were always dropping on the floor. Thanks for the info Lauren! Your room looks great. I had desks. We loved them. But now our district is forcing everyone to have tables. The tables we received were warped, and the vinyl is coming off. I have no where to storge books, supplies, ect. I am not buying anything. The district would like that. 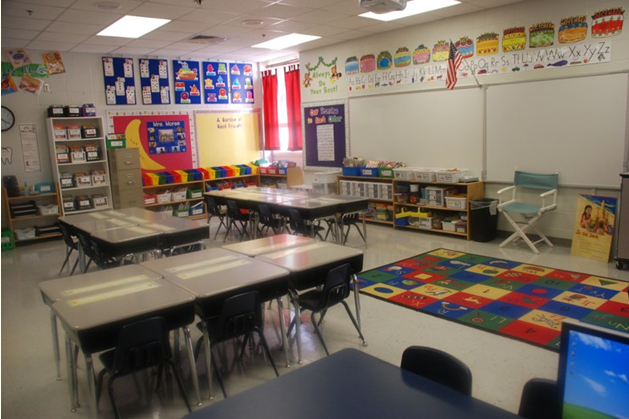 I miss the desks.